Saturday was the 65th anniversary of the start of Western Weekend. 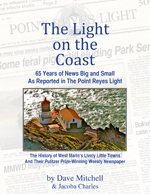 It began in 1949 with a women’s group, Companions of the Forest Circle 1018, holding a festival, fashion show, and cake walk in their hall on Mesa Road in Point Reyes Station. The following year, members of the Lions Club, many of whom were married to Circle 1018 members, added a parade and a livestock show for 4-H and Future Farmers of America members. For more than three decades, Western Weekend’s proper name was the West Marin Junior Livestock Show. Sunday was the parade’s 62nd anniversary. The 1982 and 1983 parades were called off after thousands upon thousands of spectators — a number of them unruly bikers — began showing up for parades. The 4-H Fair, however, continued uninterrupted. A color guard from the Coast Guard followed by the Sheriff’s Mounted Posse led Sunday’s Western Weekend parade down Point Reyes Station’s main street. With lights flashing and sirens wailing, a procession of county and volunteer fire department vehicles was near the head of the parade as always. Western Weekend Queen Summer Cassel will be a senior at Tomales High this fall. She lives in Inverness. Western Weekend Princess Alyssia Martinez will be a sophomore at Tomales High this fall. She too lives in Inverness. Grand Marshal of the parade Angelo Sacheli, who retired after 36 years as program manager in West Marin for county Health and Human Services, rode with his wife, Cathy Hall. The Nave Patrola, as it does every year, spoofed the Italian Army in World War I. The group won 1st place in the Adult Drill Division. Inverness Garden Club won 3rd place in the Adult Street Show division. Among the activities of the club, which this year is celebrating its 80th birthday, is maintaining flower beds in public places. The group also provides scholarships for college students from West Marin. Parade announcer Robert Cardwell (right) with other parade judges sat in the sun at a table on a flatbed truck parked next to Toby’s Feed Barn. Riding on the float once it got rolling were: editor Tess Elliott (middle); reporter Samantha Kimmey (standing at right); board member Jacoba Charles; reporter Christian Peak (at desk); guitarist Ramon Cadiz; a West Marin School student named Hiroki (who lives with his aunts Laurie Monserrat and Tor Taylor in Point Reyes Station); columnist Víctor Reyes (standing); Ingrid Noyes (driving her truck); photographer/office manager David Briggs (in cab) with his and Tess’ son Elliott on his lap; business manager Diana Cameron; ad sales representative Harry Korss; former ad department staffer Lynn Axelrod; and this retired publisher. We riders threw rolled up newspapers to onlookers, as well as wrapped candy to the kids. A wearing of the news: Three of The Light’s distaff staff wore dresses adorned with newspapers. From left: Jacoba Charles, a member of the paper’s board of directors; Tess Elliott, editor; and Samantha Kimmey, reporter. KWMR FM community radio in West Marin won 2nd place in the Adult Float division. Tending the Wells Fargo stage in front of the bank were branch officers Edith Rojas and Jeff Schrotl. Point Reyes-Olema 4-H Club members rode on a truck provided by Clover-Stornetta Dairy. The group won 2nd place in the Kids’ Float division. Onlookers crowded both sides of the three-block-long parade route down the main street. Halleck Creek Riding Club for handicapped young people, which meets in Nicasio, won 2nd place in the Kids’ Horse division. The Aztec Dancers are known as much for their colorful headresses as for their dancing to the beat of a drum. The group took 1st place in the Adult Music division. The Marin County Free Library’s float thanked West Marin residents for helping pass Measure A on Tuesday’s ballot. The measure renews for nine years the parcel tax that provides funding for the library system, and it carried with 77.7 percent of the vote. The entry won 1st place in the Adult Vehicle division. Olivia Blantz of Nicasio with two Pygmy goats, Nigel (left) and Annabelle. The latter belongs to Olivia’s sister Phoebe. Olivia, who is a member of Point Reyes-Olema 4-H Club, said the two goats are cousins and were born the same day in February 2013. It’s spelled Rabbits. From left on far side of table: Point Reyes-Olema 4-H Club member Ellierose Jackson from Nicasio exhibited a nine-week-old Angora rabbit named Joey; Tri-Valley 4-H Club member Nicole Casartelli showed a Castor mini-rabbit; and San Rafael 4-H Club member Erin Rose Charlton showed a three-year-old Lionhead named Finnegan. In the judging of 4-H projects Saturday, Ruby Clarke won a gold ribbon and Best in Show for a dress. Ashley Winkelmann won a blue ribbon for a romper made for infants, as did Camilla, Olivia and Phoebe for the rompers they each sewed. The Blantz girls also took ribbons for: photography (Phoebe) and lettuce (Olivia). As a benefit for the Aztec Dancers, women on Saturday evening sold Mexican dinners and beverages. I enjoyed a delicious pork tamale and a glass of horchata, with which I was unfamiliar. I’m still not sure what all was in it, only that it was white and tasted of cinnamon and vanilla. All in all, a first-rate discovery. Sparsely Sage and Timely is powered by	WordPress 4.9.10 and delivered to you in 0.890 seconds using 54 queries.